I'm not sure how long I sorted through the fabrics, but I'm sure that the employees were happy to finally see me ready to check out. 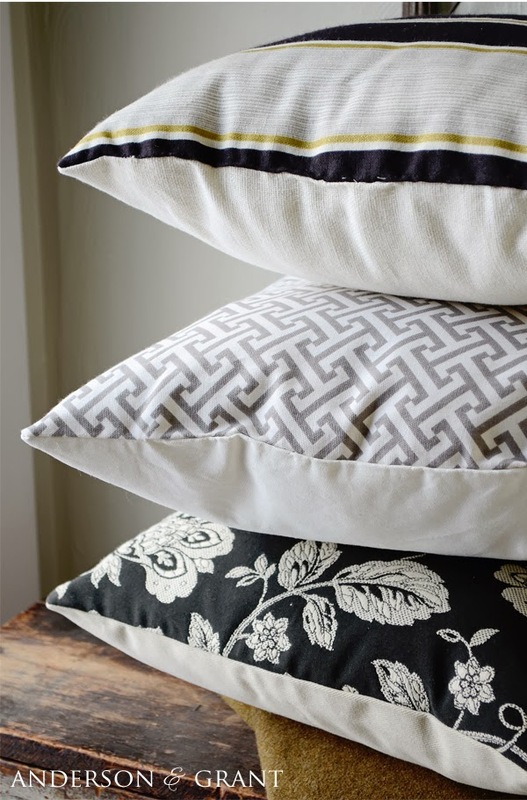 I came home with a stack of plain and pattered samples that I could mix and match for some pillows. 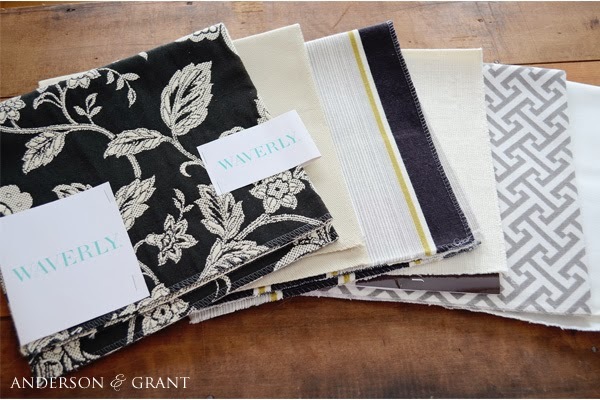 Since these were samples I knew that I wouldn't be able to find two matching pieces of fabric. 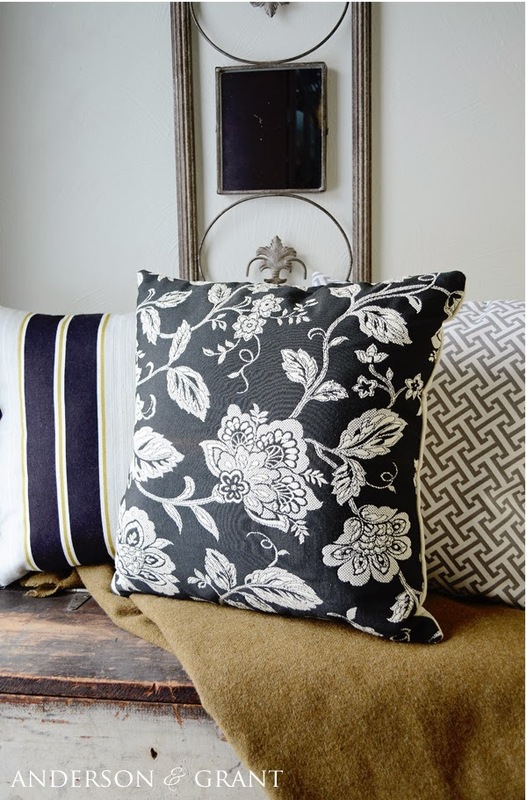 To make the pillows I searched for a coordinating plain fabric of the same texture as the pattern for the front. I love mixing patterns and textures and think that it is totally fine to do as long as all the fabrics have something in common. 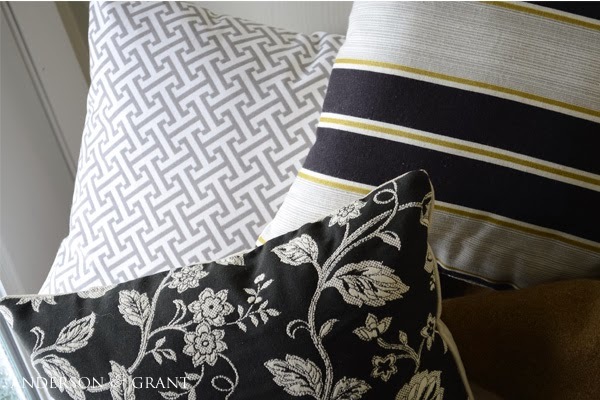 In the case of these three fabrics, they are all shades of cream, gray, and black. Wouldn't these look great mixed on your couch? I began by pinning the two coordinating squares together. 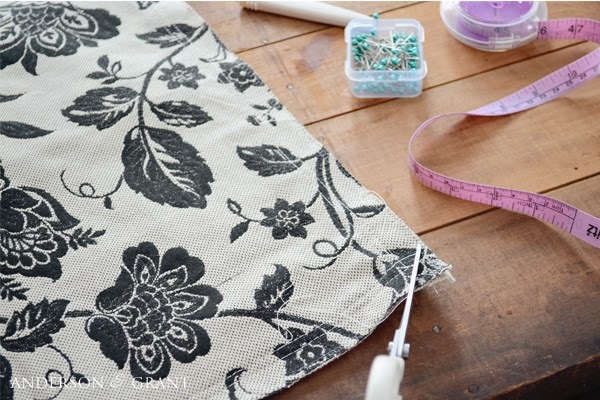 Make sure that the sides you want to show when the pillow is done are pinned facing each other on the inside. 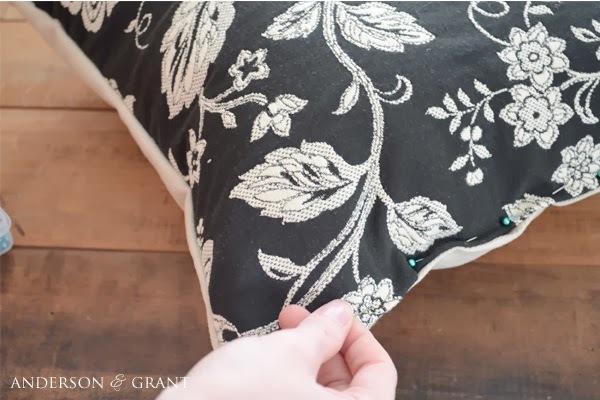 Yes, most of you are saying that this just a common sense tip....I'm telling you this because sometimes when you are pinning the fabric you don't think about this idea and you pin and sew the wrong sides together....yes, I did this with one of the pillows, even though I knew this tip! The samples all measured close to 18 inches square, so I sewed an inch seam around the entire pillow. Since the fabric is already in a close to perfect square, you know that you'll end up with a square pillow. 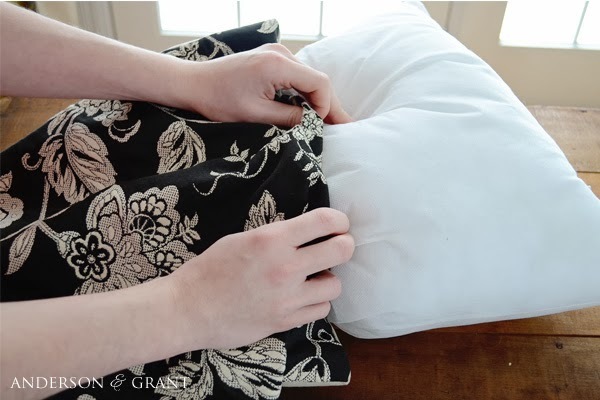 Leave an opening on one side that is large enough to fit your pillow form into when you are done. 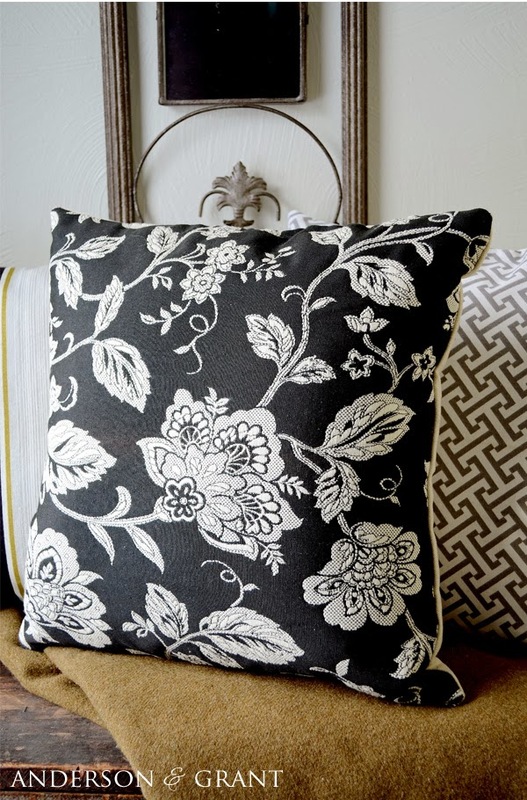 When the pillow is sewn, cut each of the four corners of the fabric. This will help your corners to be nice and crisp when the pillow is turned. I actually turned the pillow and inserted my pillow form before I did this to ensure that the pillow would fit. If you are comfortable with your sewing skills this is not necessary! 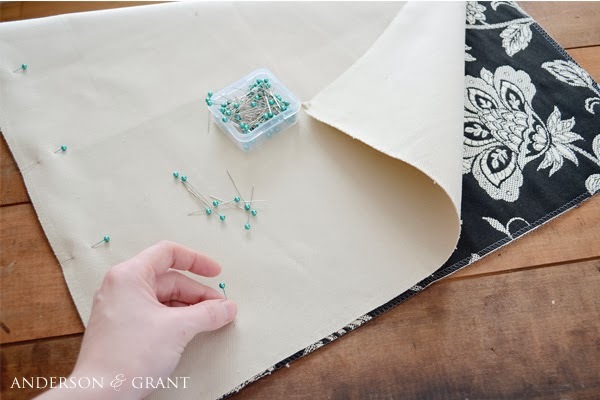 Once your corners are cut, turn the fabric right side out and carefully use a pointed object to push out the corners of your pillow. Then insert your pillow form. I purchased 16 inch square pillow forms (available at any craft store). I also added a bit more stuffing inside the pillow form before putting it inside the fabric case because I felt the pillows weren't filled enough in the corners. 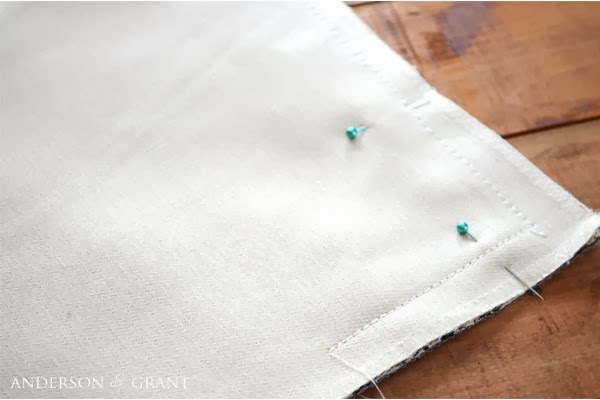 Pin the hole closed and do a blind stitch along the edges of the fabric to close your pillow shut. And you're done! Didn't they turn out great? 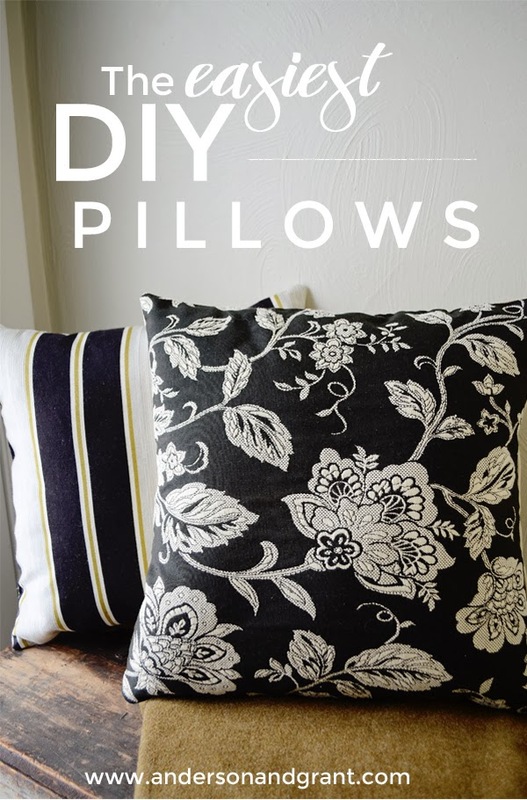 Using fabric samples to make pillows is easy even if you don't have great sewing skills because the samples are similar sized and square. Sorting through samples also forces you to be creative with mixing and matching patterns that you might not normally consider. And best of all, you can end up with some expensive fabric for your pillows super cheap. 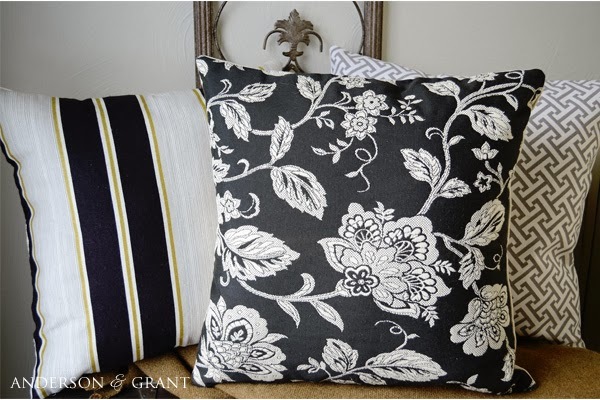 For the two fabrics and pillow form (purchased at 50% off), I spent less than $10 for each pillow! What a bargain!